Looking for Content Marketing Training? School Is Now in Session! According to our annual content marketing research, organizations are investing about one-third of their marketing budgets on content marketing — and the majority are planning to increase their spend in the next year. While this seems like good news, our research also found that fewer than half of marketers consider themselves to be effective in the content efforts they produce. So why aren’t these increased investments resulting in greater confidence and success? The principles of content marketing are sound, and people know that it should (and does) work — when done right. The problem is that content is a complex asset. It touches so many departments in your organization and needs to be repurposed across so many social channels, that it’s difficult to know just what the “right” decisions are. This is why investing your marketing budget without a clear content plan for what you want to achieve and how you will achieve it is a path that often leads to frustration and failure. Content marketing is not something many marketers are doing “instead” of something else; rather, it’s been added on to their existing marketing responsibilities. No wonder they feel overwhelmed! There’s a lot of bad marketing out there that’s being referred to as content marketing, even if it doesn’t really fit the bill. There is no one right way to do content marketing, and there are no shortcuts. And while there certainly are basic principles that can be mastered, it can be difficult to distinguish them from other marketing techniques. If you are struggling with content marketing, or want to strengthen your potential for achieving success, I urge you to go back to the basics. The key to capitalizing on your current investment and increasing your effectiveness is to ensure you are building your content marketing on the proper foundation — i.e., the essential knowledge you need to create high impact content. But where can you find this knowledge and learn how best to apply it to your content efforts? Of course, answering questions like this is why the Content Marketing Institute exists. To date, our efforts have been channeled into two key areas: a great website full of ideas and approaches, and our Content Marketing World events. For years, our conference has served as the largest and most comprehensive networking and educational opportunity in the industry. But it only comes around twice a year (once in North America and once in Australia). And with content marketing effectiveness being a pressing need all year round, many marketing professionals tell me they need more consistent, ongoing, and on-demand training to keep them from falling behind the curve. In response to those requests, and in light of the budget and effectiveness trends taking shape in our industry, we have some big news to share: Today, we are launching our newest educational resource: the Content Marketing Institute Online Training and Certification program. How do I plan and prioritize my efforts? Who is my audience, and how do I reach and engage them? What is the best way to take advantage of different channels? How can I be as efficient as possible and get the most out my efforts? How can I measure what’s working and what’s not? 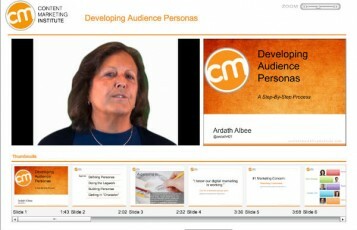 Want more proof that CMI Online Training can help guide you to greater content marketing success? Take a few minutes to explore our curriculum, and sign up for access to two free classes. For a limited time, we’re even offering a special discount promotion, which will save you some money on your full registration (see, we’re helping you get more from your content marketing budget already! ).